“How much does an LMS cost?” As an LMS research analyst and vendor selection consultant, I get a version of that question often from both LMS buyers and sellers. The true yet unsatisfying answer is that “it depends.” With over 650 LMS solutions in the world there is no universal LMS license model nor commonly accepted standard price ranges. Licenses fees can be based on usage, learner records, location, concurrency or revenue share. Many vendors require three-year contracts and many more are monthly. The license cost can be front-loaded in year 1, grow with you or be contractually consistent over time. Every LMS provider has a unique pricing or license model based on a secret recipe of guesswork, functionality, industry, definition of user or usage, number of users, bandwidth consumption and overall service level agreement. Most vendors think they are priced too high or too low and they are right. Every LMS buyer has a unique, often undocumented set of business, functional, technical, professional service and support requirements. Always up for a challenge, we at decided to sort this mess out for buyers, define the undefinable and develop an accurate guide for LMS pricing. We gathered LMS pricing from vendor websites, public RFP results, interviewed buyers and asked the vendors. We have been categorizing and defining the various licensing models, surveying vendor support for the various models and documenting pricing at any and every level as we go. In this post, we will define the different types of license models available in the LMS industry. In future posts we’ll define known pricing tiers in each model and price ranges that LMS buyers can expect to pay. There are at least 6 ways to license an LMS, with countless variations. To further complicate matters there are multiple terms used to describe the same models — none are wrong. Many LMS vendors offer multiple license model options. All vendors have a preference for a certain model. We wanted to know not only the most common ways to license an LMS but also what were vendors’ preferred license models – if any – so we asked 74 diverse vendors in our recent 2015-2016 LMS Vendor Survey about their license habits. It turns out the industry is moving away from perpetual and named user models and moving towards usage-based models. This makes sense because there has always been buyer contention about having to pay for a user license even if the learner never logged in. Additionally, the named user model never made sense for the extended enterprise (non-employee) audiences because it was too expensive for infrequent, unknown yet often numerous learners. Vendors, ever adapting to avoid unnecessary selling roadblocks, have introduced fairer models based on actual usage of the LMS. Another takeaway is that unlimited user licenses and monthly pricing models are still popular with buyers but vendors would prefer not to sell that way – but will. In the chart below, you can see a summary of vendor license model preferences. Aligning a buyer’s total set of requirements and business model with a vendor’s capabilities and license model is the critical key to finding the right LMS partner at the right price. Named User is the most common license approach used for employees LMS and a long-lived model. If you have 20,000 employees, you need 20,000 licenses and it does not matter if a learner logs into the LMS in a given time period or not. If an employee retires or moves on an organization can inactivate the license, keep the user record for reporting purposes and reuse the license with a new employee. Per named user licenses are usually invoiced annually for the year in advance and the price is all inclusive of license, administrative support, hosting and maintenance. Costs will only increase with the purchase of additional modules and/or users. The named user model license is not advantageous for extended enterprise audiences where users are generally unknown and usage can be high volume, sporadic and infrequent. But the steady cost for a known set of users makes sense for many employee initiatives. The LMS industry seems to be moving away from the “named user” model, with only 26% of survey respondents indicating that they prefer that model. Actual Usage LMS Licensing is the most popular license model for both extended enterprise (non-employee) and employee LMS initiatives in 2016. Associations, training companies, corporate channel, customer and other extended enterprise buyers can create any number – hundreds of thousands even – of active ongoing accounts but a buying organization only pays for active usage. Usage definition varies widely by vendor and business situation. Usage can be counted based on users logging in, registering for an event, buying a course or launching a course and can be measured and paid for monthly, quarterly or annually. Typically vendors will provide discounts for a buyer contractual commitment to a certain minimum threshold of usage and cost. Not all LMS vendors support all the combinations of usage licensing– some prefer logins per month, others prefer course registrations per year and some will negotiate a custom model. This flexibility of usage definition makes the model ideal for extended enterprise (non-employee) learning programs because buyers can negotiate or find agreeable models to their unique usage making the relative cost of the solution more agreeable. 48 of 74 (65%) LMS Vendors surveyed offer a flavor of actual usage model of licensing. The Software as a Service (SaaS) LMS license is a broad and often vendor interpreted term in the LMS industry. It can be interpreted broadly to mean any hosted or pure cloud LMS solution that has an ongoing monthly or annual subscription fee or more narrowly as only pure cloud, multitenant LMS solution. Both the above usage and named user models can be considered a SaaS license. It’s best to dig a little deeper to understand the exact model and not settle for a SaaS categorization. Perpetual pricing is not as popular as it was 10 years ago but it still exists. Perpetual is how all licensing used to be before the cloud – you buy it up front, install it and pay annual maintenance to get tech support, updates and upgrades. Although perpetual licenses can sometimes be found in a hosted manner in most cases perpetual is limited to local or 3rd-party installed LMSs. Organizations in highly regulated industries still tend to bring enterprise systems like an LMS in-house and prefer perpetual for their employee solutions. A perpetual license is a capitalized cost and paid up front. Some buyers have a use-it-or-lose-it budget and a perpetual license is ideal. 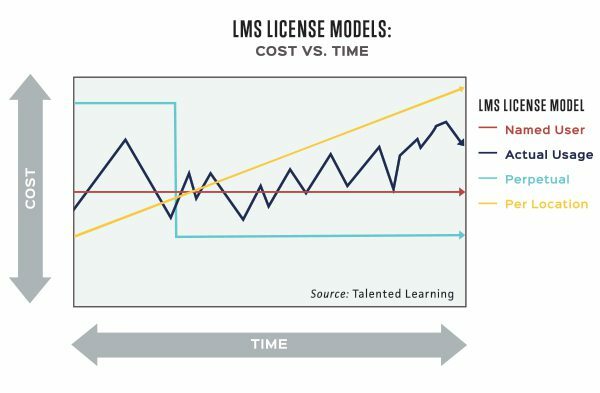 The three or five-year total cost of ownership of an LMS is typically less when paying upfront for a license. 32% of LMS vendors surveyed offer a perpetual model option and only 10% state that they prefer the perpetual model. Although the lump sum up front is tempting, getting a client to pay for the next 10 years straight is much more lucrative. The “per location” LMS license is a specialized model popular in retail, dealer, restaurant and other multi-location franchise industries. A franchisor often provides franchisee locations with an LMS loaded with the appropriate content, roles, reports, etc. for a franchisee to succeed. With the high turnover in these types of industries, counting users can be laborious for LMS vendor, franchisor and franchisee. Per location licensing solves the complexities by assigning a fixed price per franchise location – not learners – making it easy for locations to be added over time at a predictable rate. This also makes it easy for franchisors to charge franchisees a fee for the shared LMS service. Only 6% of vendors offer and prefer this approach to licensing. I believe the need for this type of license has been replaced by an actual usage license. The unlimited use LMS licenses allow exactly that – unlimited users, courses, bandwidth. They come in two distinct flavors – inexpensive and expensive. Tiered pricing is the concept of a lower price/user with more users. With many vendors, you can eventually have enough users or usage to enter their highest “unlimited users” tier which can be as low as 20,000 learners or as high as 250,000 or more. The biggest providers typically don’t have an unlimited tier because they see it as leaving money on the table. On the other side of the spectrum, newer vendors just entering the marketplace offer an all you can eat license for nominal fees mainly because they are trying to get customers at any price. Once a vendor has a regular flow of predictable license revenue they tend to move away from low-cost unlimited usage and introduce tiered pricing over time. 42% of vendors of survey respondents offer some version of an unlimited use license option. Our research hasn’t led us to the “right” LMS license model in the industry. Rather, we learned there are more variations of LMS license models than there are LMS vendors. Based on dozens of variables, different LMS license models make more sense than others to different buyers. Buyers have lots of choices. As always, it is important to take a step back and completely define your LMS requirements and compare vendor pricing through the lens of a common license model to get an accurate view of true costs.